Clopay's Premium Series offers exceptional insulating R-Values to improve your home's energy efficiency. All Premium doors are designed with a 3-Layer system of STEEL+INSULATION+STEEL which gives you a stronger, quieter garage door. They are available in a wider range of colors than the Value and Value Plus series. How many doors do you need? If you have two different size doors, but want the same design, please note that in the comment box below. Enter the width of your door in feet. Enter the height of your door in feet. Choose an insulation thickness. The higher the R-Value, the better the insulation. Insulation obviously helps with energy efficiency, but it also strengthens the door and helps with noise. We recommend Torsion Springs for better operation and increased safety. However, Extension springs may be necessary if your headroom is less than 12"
Please enter your choice of Grill Option below. Enter the name of the Designer Style Window you would like. Make sure to say Long or Short Panel. Enter your Architectural Window Choice below. Be sure to note Short or Long Panel. Fill out this box with any other information. 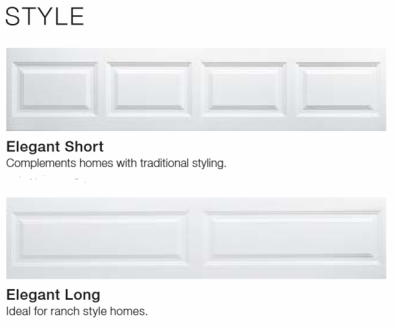 For example, if you want a opener or have two doors or different sizes.